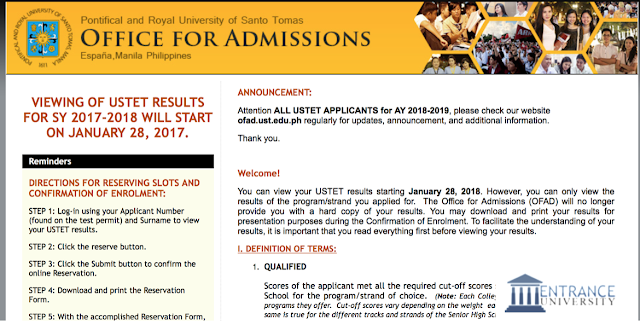 Manila, Philippines - The official website of University of Santo Tomas , UST Office for Admissions (OFAD) will officially announce the UST Entrance Test (USTET) results for AY 2018-2019 on Monday, January 28, 2018. All USTET applicants for AY 2018-2019 can view the complete results in this link http://myuste.ust.edu.ph:8888/admission/results.jsp once viewable online. Qualified applicant reservation of slots online and payment of reservation fee will start January 29 to February 9, 2018. For the list of accepted waitlister, the Office for Admissions (ofad.ust.edu.ph) will annouce the list of accepted waitlisters on February 16, 2018. Your acceptance to your program of choice will depend on the availability of slots. ACET Exam Result 2018-2019 are out !